Important Dates Where do I Vote? Sample Ballots Joanne Rajoppi How to Vote Who’s Running? Astrophysicist Carl Sagan is one of the notable persons featured in the new Arts & Sciences in Union County 2019 Elections Date Calendar. The calendar is available free on request from the office of Union County Clerk Joanne Rajoppi. Credit: NASA. Union County Clerk Joanne Rajoppi is pleased to announce that the free 2019 Election Date Calendar is now available. 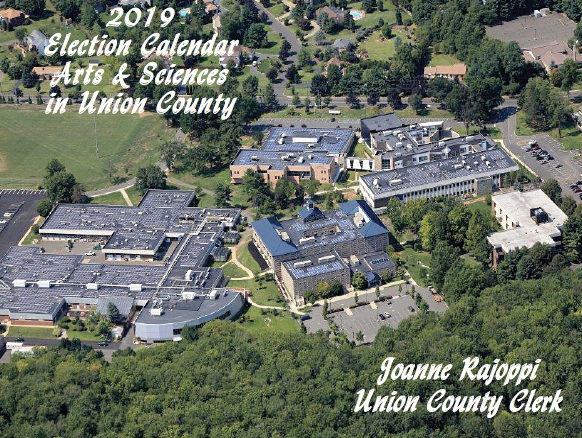 The new Arts & Sciences in Union County calendar provides all important dates and deadlines for the 2019 election cycle, along with full page illustrations highlighting history-making people, places and milestones in Union County. “From Paul Robeson to Carl Sagan, Union County has played an important role in the cultural life and scientific progress of our nation,” said Ms. Rajoppi. “I encourage all Union County residents to request the 2019 calendar and keep informed on important dates in the election cycle, while learning some interesting facts about our community’s place in history.” Among other observations of note, the calendar describes which corporate campus in Union County is home to nine Nobel Prize winners, who wrote the popular 1963 children’s book Old Black Witch, and how one Union County village became the very first municipality in the U.S. to be equipped with Thomas Edison’s electric lights. As a convenience to Union County residents who are planning to vote by mail in 2019, each calendar also includes two pull-out Vote by Mail application forms. To request your calendar, please visit the Calendar Request Form. A new law signed by Governor Phil Murphy in August drastically changed the Vote-by-Mail rules in New Jersey. These changes are effective immediately and will impact the November General Election. One of the changes involves how a voter can apply for a Vote-by-Mail Ballot. Before the change in the law, a voter had three options on the application. The voter could opt to receive a Vote-by- Mail Ballot for one election, all elections in one calendar year, and all future general elections. Now, a voter has only two options for voting by mail. A voter can request a Vote-by-Mail Ballot for one election or for all elections every year until the voter opts out in writing. Voters can download the updated Vote-by-Mail Ballot application from our Elections Website by clicking here and from the County Clerk’s free Union County Votes Mobile App, which can be found on the Apple App or Google Play stores. All 2016 Mail-In Ballot voters have been sent a letter from the County Clerk’s Office advising of this change. Most importantly, the new law mandates that all voters who voted by mail in the 2016 General Election be sent a Vote-by-Mail Ballot for the 2018 General Election, even if they did not request one. If these voters do not want to receive a 2018 General Election Mail-In Ballot, they must notify me in writing to opt out by printing out and filling out this form. It is important to remember that, according to State law, any voter who receives a Vote-by-Mail Ballot will not be permitted to vote on a voting machine on Election Day. Voters will either have to utilize the Vote-by-Mail Ballot they receive or vote on a paper provisional ballot at the polls on Election Day. If you have any questions about the Vote-by-Mail Ballot process or about the new law, I encourage you to contact my Elections Division at 908-527-4996 or ucvote@ucnj.org. A fully updated, redesigned version of the popular Union County Votes app is now available as a free download for mobile devices. The Union County Votes helps members of the public quickly and easily access important information on voting and elections, while on the go. Android users please uninstall the app and use the link below to download the improved version. Apple users can update their existing app in the Apple store. If you run into any issues please e-mail websupport@ucnj.org for technical assistance. Elizabeth - The Union County Clerk’s Elizabeth Office hosts special Saturday hours, 9:00am – 1:00pm, for Vote by Mail Voters the Saturday prior to Primary and Election Day. Westfield - The Union County Clerk’s Westfield Office is regularly open Saturday 9:00am – 1:00pm. ID Required to Leave Your Voted Ballot in County Clerk’s Lock Box - A 2015 law requires any voter who wishes to leave their ballot in the County Clerk’s Lock Box or return it personally or by authorized bearer to the Board of Elections, is required to provide a NJ Driver’s License or NJ Issued Identification Card. Availability - Vote by Mail Ballots are available 45 days prior to election day. They may be requested by mail up until 7 days before election day; the application must be physically in the Clerk’s office to be valid. A voter may also apply in person up until 3pm the day before election day.